TV show dates: March 27, 2018 — present. 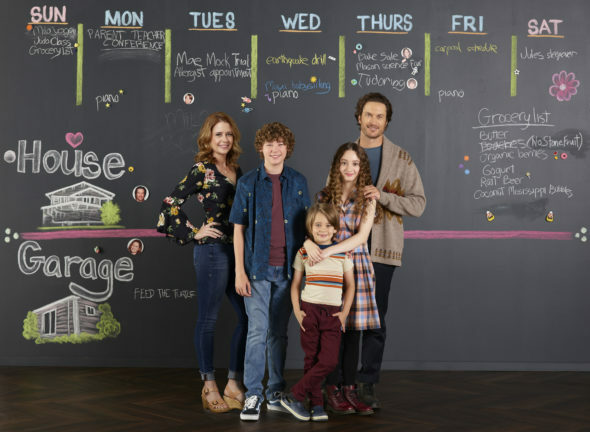 Performers include: Jenna Fischer, Oliver Hudson, Bobby Lee, Diane Farr, Lindsay Price, Olivia Keville, Van Crosby, Sander Thomas, and Kelsey Asbille. From Emily Kapnek, and based on the Danish TV series, Bedre Skilt end Aldrig, the Splitting Up Together TV show is a comedy inspired by the idea of “Bird Nesting.” In this co-parenting approach, divorcing parents design their new living arrangements to allow the children to remain in the family home, in order to minimize disruption to the kids’ lives. Once upon a time, Lena (Fischer) and Martin (Hudson), were deeply in love. As sometimes happens, life and everything that fills it, sucked the romance from their marriage, until they were just roommates, with children in common. Where Lena feels she took on the lion’s share of the burden with the house and kids, it seems to Martin even his best efforts failed, so he just stopped trying. Now, they have arrived at the conclusion that everyone would be happier if they divorced. Wanting what is best for their three children, Mason (Crosby), Mae (Keville), and Milo (Thomas), Lena and Martin decide to “Bird Nest,” rather than sell their house. Since they’re still underwater on their mortgage, it’s not like they have much of a choice, anyhow. Now, when Lena is “on duty” with the kids, Mason will live in the garage, and vice versa. As they switch off, from week to week, they start to get a clearer picture of what the other person brought to the home and family. They also start to better see their own short-comings. Will splitting up together reignite their love and bring them back together, or is this new normal? Stay tuned. What do you think? Do you like the Splitting Up Together TV series? Should this ABC TV show be cancelled or renewed for another season? Talk about destroying a good show. What the heck happened that they got Lisa Apple pregnant and part of the family. They had the best pretext, Jenna Fischer and Martin (don’t know real name) were magic. The sour little daughter and the pregnant sister were downers, but it would still have remained my ultra favorite. Lisa Apple bit—I’ve become a hater of Hollywood Kardashian crap. For a second, you had a great show. Then, Hollywood values stepped in. I’m done if Lisa Apple stays, it’s too bizarre. Asking the kids to accept this? C’mon! !